I think the number one desire for women everywhere is to own a magic wand which can mystically flatten their belly without them having to lift a finger. Unfortunately, that doesn’t exist yet. Maybe in the future. But until then, we’ve got something that comes pretty close. Below you’re gonna learn a super easy Japanese technique that’ll teach you how to lose weight without dieting or exercise. And the best part is that it can be done anywhere, anytime because it is completely free and you won’t have to spend a penny. Dr. Fukujuji, a Japanese doctor specialized in disorders of the pelvis, is the mastermind behind this “magic” weight loss technique. Through his research he found out that any extra layer of fat around the belly is caused due to the misplacement of the subcostal and pelvic bones. So he came up with this simple method of weight loss, which only have to do with better alignment of the pelvis and spine. This method also helps you to improve your posture and relieve lower back pain. All this technique involves is laying down in a particular position 3 times a day for 5 minutes. Even though this sounds super easy, it’s really unpleasant to lie in the same way for 5 whole minutes. Believe it or not, there’s an easy way to lose weight that doesn’t implies pills, expensive equipments or starvation. All you need is a towel and 15 minutes from your time. Lie down on your back and place a rolled up towel under your lower back, right at the belly button level. Stretch your entire body, with your arms over your head. Keep your palms facing down, with the pinky fingers touching each other. Place your legs at the shoulder width apart, with the big toes touching each other. Keep your head straight, looking towards the ceiling. Hold this position for about 5 minutes. When you get up from this position, make sure you’re not doing any sudden movement. Roll to your side, get into a sitting position, then stand up slowly. Follow this exercise 3 times per day, for 5 minutes each. This position is not natural, so don’t expect to be comfortable. If you can’t do 5 full minutes, hold it for as long as you can. Then try to increase the time with every day, until you reach 5 full minutes. This method also works for your breasts, if you want to lift them up a little. Just place the rolled up towel under your bust. For a more defined waist, place the towel under your ribs. 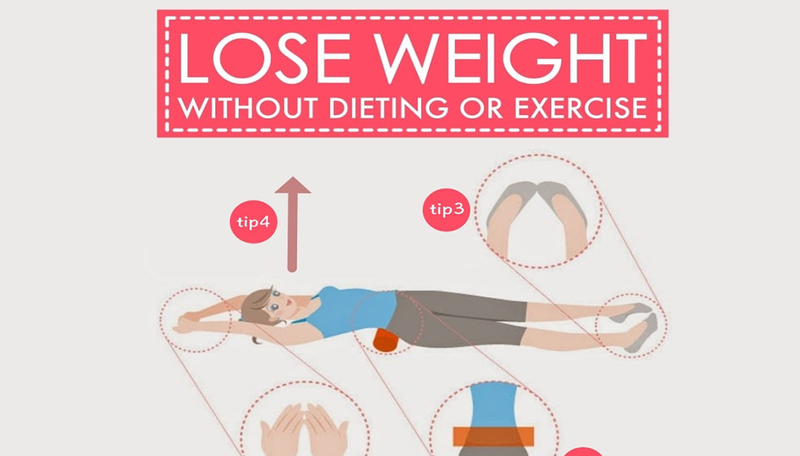 You will not lose weight overnight with this method. However, if you perform the exercise daily, you will notice a steady decrease in belly fat after a few weeks. This exercise is not recommended for those who suffer from chronic back pain or hip problems. Pregnant women are also highly advised to avoid this exercise regimen. Between this Japanese technique to lose weight and a diet + workout plan, I would definitely go with the second one. But if you can’t stick with a diet, or you’re too lazy to exercise, you can give this method a try. Now that you know how to lose weight without dieting, let us know how this method worked for you. Leave a comment with your progress to inspire or help other readers. Thank you!